During a flight from Tulsa in 2005, Vickie discovered some amazing artwork on horse figurines in an airport gift shop. Little did she know at the time these Painted Ponies would change her life and become a rebirth for her artistically and begin a journey she has embraced. Inspired to pick up a brush after years of "being to busy to paint raising a family", Vickie began creating some of her own Painted Ponies that became very popular with the collectors of these unique pieces of art. Entering a competition in Lexington, KY in 2007 specifically designed for these Painted Ponies, she was awarded First Place with her Wounded Knee piece and caught the eye of the Trail of Painted Ponies. She quickly became one of their top designers, her design speciality is creating Native American pieces that showcase a historical perspective, giving respect to the people it represents. 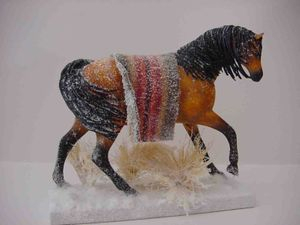 It is because of her discovery with The Trail of Painted Ponies that has allowed Vickie to pick up a brush and begin a fantastic journey that allows people to enjoy the art she is inspired to create. Remember Wounded Knee, original design.